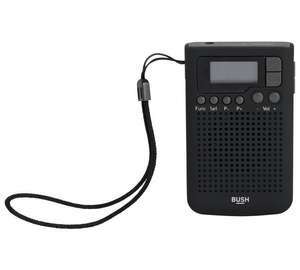 Take your radio with you wherever you go with this Personal Radio from Bush. There's a speaker for playing out loud and a headphone socket for personal use. Great for making time fly whilst doing housework. Output power to headphones is 0.4 watts RMS - the average measurement of a speakers output. That's an FM good deal if you can find one, there is availability in Lanark but too far for me to be bothered. No stock within 40 miles of us. Its available on some locations if you find. You might need to tune it in to find one!! Lots of phones don't have this now. I know quite a few Samsung phones (my Note 8 included) no longer have this function. Why do you need one if you have a mobile phone? With the earlier mobile phones a well know feature was an AM, FM radio. But be careful to choose FM or AM stations (as listed) as it will also find stations through the Internet which you will have to pay for to stream if you are away from home. You may need to use headphones or earbuds as these are often used as aerials and reception is not so good or may even not work if you use the internal phone speaker. My S7 Edge does not have this function. Here is the core reason for any function. Some people like a dedicated device. Some people like a non-dedicated device with features. e.g. some people have one laptop, some people have 5 laptops. You asked why.Here is the core reason for any function.Some people like a …You asked why.Here is the core reason for any function.Some people like a dedicated device.Some people like a non-dedicated device with features.e.g. some people have one laptop, some people have 5 laptops. I'm really just drawing the attention (I hope) of people who didn't now that the facility already existed in their phones. I had completely forgotten about it till I started thinking about phones I used to have! Personally I prefer the all-in-one approach if it's fairly easy to use. Nah. I might have bought one if there was stock nearby. Thanks for the tip, might get one of those . Oos south west wales ????? ?